Tower Hamlets Homes has commissioned major works on the Old Market Square, Pelter Street (odds) and Hackey Road blocks. The building work has planning permission and the construction contract has been awarded to Mulalley (the construction company). 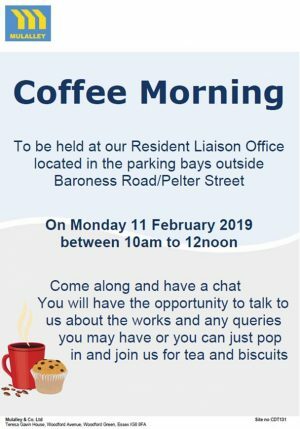 We recommend that all residents of Old Market Square, Pelter Street (odds) and Hackey Road blocks join the Newling North Estate email group to keep up to date. Email NewlingNorthEstate@googlegroups.com to join. We will post information of meetings about the works and notices from the contractor on this page. 10 April 2019 - Mulalley has requested that anyone renting a pram shed contact the Resident Liaison Team on 020 7538 4640 to arrange a time for them to access the shed in order to conduct a survey. 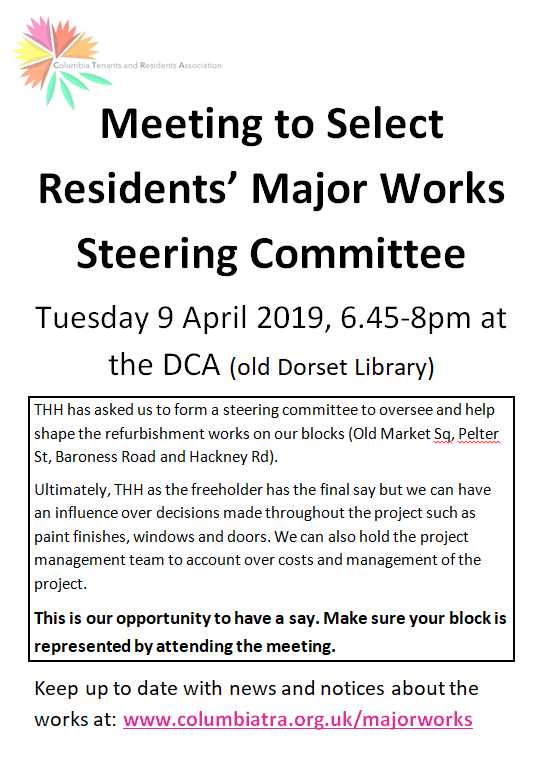 30 March 2019 - The CTRA has organised a meeting for residents of Old Market Square, Pelter Street, Hackney Road and Baroness Road Blocks to select a steering committee to oversee the major works. Please come and ensure your block is represented. 30 January 2019 - We have received the following invitation from Mulallay's to residents affected by the works. 14 January 2019 - We have been advised that scaffolding will start going up on 64-86 Hackney Road and 1-63 Pelter Street this week. 11 December 2018 - A meeting was held by Tower Hamlets Homes to introduce residents to the contractor Mulalley. Minutes, taken by CTRA can be found here. Mulalley is the building contractor for the Old Market Square, Pelter Street (odds) and Hackney Road major works project. Any information we receive from them we will post on this page. Michelle and Tina here to help us and will sometimes be based on site. Contact them with any issues related to the building works. They are available on her mobile after office hours but please keep late calls to emergencies only. If they are unable to answer your call, please leave a voicemail or send a text and they will respond when they can. Onsite resident liaison officers are easy to spot as they well orange high viability jackets. All Mulalley staff, subcontractors and visitors carry an identification badge and will produce them when asked. Building works attract bogus visitors, so please be extra aware.